Senior quarterback Kain Colter displayed "APU," short for "All Players United" on his wristbands during a September game against Maine. Colter is leading the movement to attempt to get Northwestern football players represented by a union. 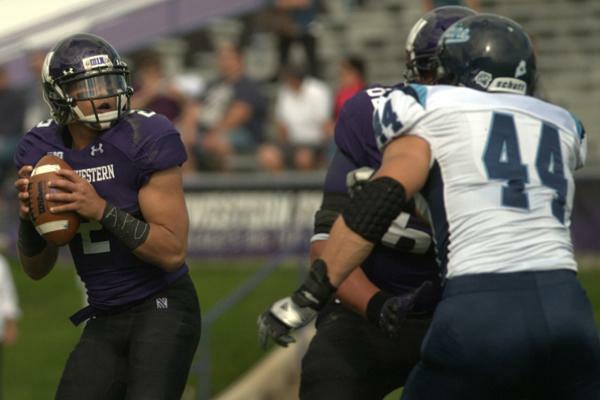 Senior quarterback Kain Colter is heading a group of Northwestern players seeking to be represented by a labor union, he announced at a news conference Tuesday morning. The effort, the first in history by college athletes, is backed by the National College Players Association and the United Steelworkers union. NCPA president Ramogi Huma filed a petition to the National Labor Relations Board on behalf of the NU team. Huma and Colter said an “overwhelming majority” of Wildcats players voted to sign union cards, thus asking for unionization. Thirty percent of the members of a given group must sign cards in order for the NLRB to consider their request. At the news conference Tuesday, Colter read a statement from NU’s players, explaining the group’s motivation for the historic action. The unionization effort began last spring when Colter reached out to Huma for help gaining representation in attempting to improve conditions in which they play college sports. The Chicago NLRB branch will hold a hearing and rule on the players’ proposed unionization. Once a decision is made, either side may appeal to the agency’s national branch in Washington, D.C.
Colter publicly expressed his allegiance with Huma and the NCPA in September when the quarterback wore black wristbands with the letters “APU” — standing for “All Players United” — during NU’s Sept. 21 game against Maine. If certified, the entity representing the players would be called the College Athletes Players Association. 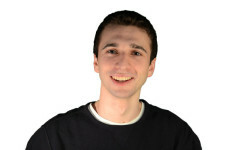 The organization was created by Huma, Colter and former University of Massachusetts basketball player Luke Bonner. At first, CAPA would represent only FBS football and Division I basketball players at private universities, as public institutions are governed by separate state labor laws. Huma said revenue sports presented the “strongest argument” for increased rights for players. Huma said he hopes to eventually expand CAPA’s representation to all college athletes. Huma said CAPA will initially push for improved concussion and medical protection, guaranteed scholarships and additional money to cover college attendance expenses. If the union is approved by the NLRB, members would be classified as “employees” of the university and receive benefits as such, including the ability to bargain collectively. CAPA and United Steelworkers allege football and basketball players already essentially are university employees, given the amount of time they commit to athletics, the amount of money they bring in to schools and the fact that they are paid in the form of scholarship money. Colter, Huma, and spokespersons from United Steelworkers used the term “college-athletes” in place of the usual “student-athletes,” because they believe being an employee and being a student are not mutually exclusive. Above all, Huma and Colter emphasized the need for players to have a “seat at the table” in discussion of their rights. Currently, only schools — and not the players themselves — are members of the NCAA. Huma said this creates conflicts of interest for coaches and trainers, whose jobs are dependent on athletic success above all else. As the system currently stands, he said, players are without a voice in NCAA matters. The NCAA issued a statement Tuesday expressing its opposition to the proposal. In a separate statement, NU athletic director Jim Phillips said he supported the athletes’ goals but not their methods. The NFL Players Association voiced its approval of the NU players’ actions. Colter said multiple times Tuesday his involvement with CAPA is not a reaction to any specific issue he had at NU and maintains respect for the school and its football program. That includes coach Pat Fitzgerald, who objected to aspects of the “APU” display in September but tweeted Tuesday afternoon he is “incredibly proud” of Colter and his teammates. Colter said he spoke with Fitzgerald on Tuesday morning to warn the coach of the forthcoming announcement. The quarterback played four years at NU, throwing and rushing for more than 2,000 yards each over 40 career games and accounting for 50 touchdowns passing, rushing and receiving. His college eligibility expired after the 2013 football season and he has since hired an agent and begun preparations for April’s NFL Draft.